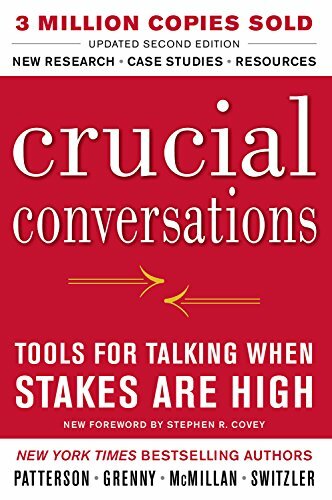 I'm going to be doing a full part series summary on the book Crucial Conversations. This book has so much valuable information that I'm going to try to dissect it and break it down for you all as much as I can. Now what is a crucial conversation? These are the conversations that we have when the stakes are really high. These are conversations that we're having at home, we're having amongst our friends, our colleagues within our teams and our organizations. These are the type of conversations that if not done properly the consequences can be very severe. So today, I actually want to talk about the full elements of making a decision, and how do you decide. So the first one is going to be on command. And if you wanna follow with me, this is actually starting on page 180 of the book. So what is command? Command is a decision that you make without involving others. You have to be really careful with command though, because sometimes it can come off too authoritative — It can come off too demanding. But there's sometimes that there is those circumstances as leaders that we just have to make a decision and when we have to make that decision it is called command. Do not pass these out like candy. Right, don't go around commanding your family, your teams, your friends to do what they have to do. Use this when you have a tight deadline, when you know ultimately that the decision that you have to make is gonna be a hard one. Not everyone is going to agree with your decision, necessarily, but it has to be done. Right? So that is a command. We're not gonna do these kind of decisions every day, but very rarely when it's corporate. It's important to not act as if you want somebody else's opinion if you've already made the decision. Offer them the courtesy to explain to them why you've already made that decision, and why you're not necessarily open to a discussion on it. With command though, I would encourage you to have some areas where you may be a little bit flexible. Is there a component of that decision where you think that you need to flexible and a little bit reasonable? So that's a first step of decision which is command. This is a decision type, remember that we don't do every single day, but sometimes as leaders we need to make these tough decisions. The second one is consult. With consult this is very collaborative, but you have to mean it, right? So if you're going to make a decision based on a group thing or within your family, you have to really want the opinions of the other person. You really want to understand what the rest of the team has to say before you make that decision. Often times, if you are actually trying to make a command decision, but you raise it as a consult decision, it's going to come off very insincere. And the people that you're communicating with are going to be able to sense that this is really a command decision, and you're kind of masking it as a consulting type decision, which is not a good thing. I love this type of decision making (when executed correctly) because it allows you to have shared responsibility, good or bad. So if the outcomes are good, you all share in it. If the outcomes are not so good, you're all sharing it. But you will get more people to actually go along with you in that decision if you consult. You hear what they have to say. You may not necessarily agree, but you allow them that platform to be able to discuss it. The third type is a vote. There's sometimes when the room is divided, and you have to take a vote, and the majority wins. The good thing about a vote though is that it's very clear. It's very black and white. But what you have to really be careful with when you're going with this type of decision is that you hear everybody out. Everybody has an opportunity to express themselves, good, bad, or indifferent. We wanna make sure that we're being very respectful when it comes to vote because by virtue, with voting is that there's two sides to the story. Voting is very clear, and there's times when you can't make a decision that you can then just vote it out. The fourth type of decision is consensus, this is where we as a team all agree. And so this type of decision probably takes the longest, because it's a lot of talking, hashing out conversations, brainstorming, tearing it apart and then coming together. But consensus, by virtue, means that we all agree to move forward with the particular decision. Now we may have to dialogue and debate for a little bit, but ultimately we all agree to move forward. So it's important when we're having these crucial conversations that we decide what type of decision we're going to take. Are we going to do command? Are we going to consult? Are we going to vote? Are we going to have consensus? So I hope you learned something from these four points. I look forward to discussing other elements of this wonderful, wonderful book Crucial Conversations on my Youtube Chanel and on this blog. Subscribe to my Youtube Chanel here.